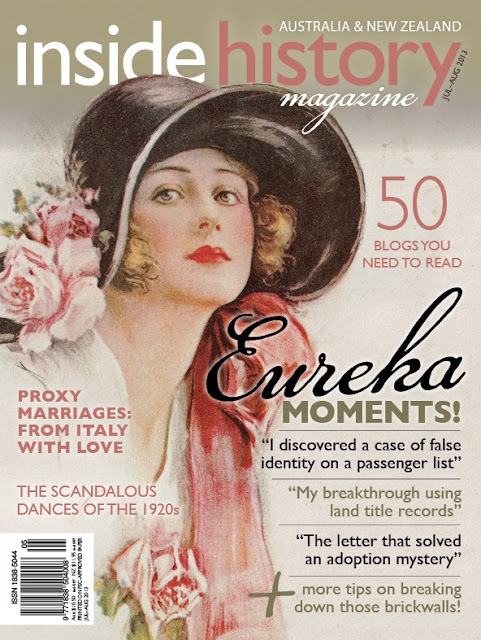 Inside History magazine with a Carnamah cover! We're honoured to reveal that there's a Carnamah cover on the latest edition of Inside History magazine! The cover's illustration comes from one of the many items digitised to be part of the recently expanded Virtual Museum on our website. For the full story on the image you can get a copy of Inside History magazine from stockists around Australia and New Zealand, or online via their website at shop.insidehistory.com.au. In the meantime we invite you to take a look at our online Business Houses exhibition to discover the image in its original format. Merry Christmas for 2014 and from the 1930s! We've been named in Inside History's 2014 Top 50 Blogs! Capacity Reached at CBH = Wheat on the Ground! Attention Virtual Volunteers: Thank You! Double short-listing in the Museum & Galleries National Awards! Perth Festival's The Giants and a Carnamah connection! A History of Australia in 33 Places = Carnamah + 32 others! Carnamah Historical Society & Museum 2011-2015. Powered by Blogger.